The United Nations has stated that denying smallholder farmer access to land is a denial of their right to food and livelihood. According to FAO, about 70 percent of the world food supply comes from the smallholder farmers. While the world population is expected to reach 10 billion by 2050, it has been projected that world food production is increased by 50 percent by 2050. This calls for proper land reforms to make agricultural lands accessible to smallholder farmers in order to achieve SDG 2. Therefore, this study was conducted to assess the impact of the accelerated conversion of fertile arable lands to real estate development in Ghana and policy gaps. The study, which was exploratory, reviewed journals, articles, books, conference papers, policy briefs, workshops reports and other relevant materials to identify and assess the problem, and policy gaps. The study has revealed that even though, the structural adjustment programme in Ghana brought to light prospect to the private sector, it worsened farmer’s plight as many lost their lands to companies including the real estate due to lack of documentation. The study revealed that in the western region, over 12,500 acres of agricultural lands have been sold to oil and gas related companies for other uses. In the central region, about 2,000-2,500 acres of lands at Gomoa and Awutu Seenya have also been lost to real estate developers. Findings also revealed that one-meter square decrease in land size decreases food-driven investments by $1.72 in the area. The problem is alarming, leading to loss of biodiversity, livelihood and deepening poverty in affected communities. 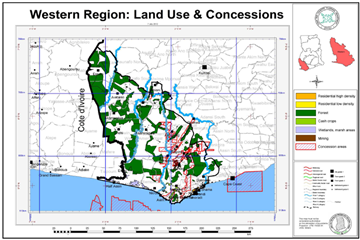 The study recommended law enforcement on the existing land use and spatial planning Act 2016 and sensitization on Convention on Biological Diversity, Ramsar, and consequences of the problem on food security in Ghana. Emenyonu, C., & Eririogu, H. I. (2017). Analysis of Land Grabbing and Implications for Sustainable Livelihood: A Case Study of Local Government Areas in Nigeria, 8(8), 149-157. Wisborg, P. (2013). Human Rights against Land Grabbing? A Reflection on Norms, Policies, and Power. Journal of Agricultural and Environmental Ethics, 26(6), 1199-1222. Marks, D., Sirithet, A., & Rakyuttitham, A. (2015). Land Grabbing and Impacts to Small Scale Farmers in Southeast Asia Sub-Region, 50. Retrieved from http://www.iss.nl/fileadmin/ASSETS/iss/Research_and_projects/Research_networks/LDPI/CMCP_60-Samranjit.pdf. Titche, A. (2016). Land Grabs & Food Security: The International Community Should Adopt a Code of Conduct to Protect Local Communities and Improve Global Food Security, (October), 473-503. Kachika, T. (2010). Land grabbing in Africa: A review of the Impacts and the Possible Policy Responses. Oxfam International, 1-69. Bank of Ghanaff. (2007). the Housing Market in Ghana. Bank of Ghana, Research Department, ISBN: 0855(November 2007), 1-46. Ministry of Water Resources, W. and H. (2015). Ministry of water resources, works and housing national housing policy 2015, II(Housing), 52. Ansah, S. (2014). Housing deficit and delivery in Ghana: intervention by various Governments. Isdsnet.Com, 3(5), 978-988. CHF International. (2004). Strategic Assessment of the Affordable Housing Sector in Ghana, (December), 1-68. Ghana Statistical Service. (2014). Housing in Ghana, 1-73. Retrieved from http://www.statsghana.gov.gh/docfiles/2010phc/Mono/Housing in Ghana.pdf. DeGeorges, P. A., & Reilly, B. K. (2009). The realities of community based natural resource management and biodiversity conservation in Sub-Saharan Africa. Sustainability, 1(3), 734-788. Sustainable Fisheries Management Project, (2015). Sadinella Value Chain. Ministry of Lands and Forestry. (1999). REPUBLIC OF GHANA MANAGING GHANA’S WETLANDS: A National Wetlands Conservation Strategy, 1999. Molini, V., & Paci, P. (2015). Poverty Reduction in Ghana Progress and Challenges, 1-66. Niles, M., Esquivel, J., Ahuja, R., & Mango, N. (2017). Climate Change & Food Systems: Assessing Impacts and Opportunities, (April). FAO, IFAD, UNICEF, WFP, & WHO. (2017). The State of Food Security and Nutrition in the World. Food and Agriculture Organization of the United Nations. Retrieved from: www.fao.org/publications%0Ahttp://www.fao.org/state-of-food-security-nutrition/en/. Febriamansyah, R. (2015). Land Grabbing and Deforestation: Community Perception on Forest Land Ownership in Dharmasraya District, West Sumatra, Indonesia, (58). Appiah, D. O., & Osman, B. (2014). Environmental Impact Assessment: Insights From Mining Communities in Ghana. Journal of Environmental Assessment Policy and Management, 16(04), 1450031. Ulfstein, G. (2004). Indigenous Peoples’ Right to Land. Max Planck Yearbook of United Nations Law, 8(1), 1-47. Suárez, S. M. (2015). The right to land and other natural resources. FIAN International Briefing, (December). United Nations. (1992). Convention on biological diversity. Diversity, 30. Graham, T., & Korboe, D. (1998). Housing policy in Ghana. Habitat International, 22(2), 245-257.